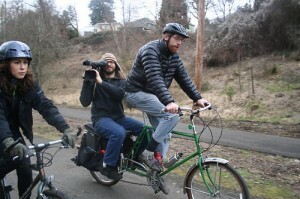 Who likes to film by bike. Would he film on a crane? Could he film in the rain? I would film in the rain. All the way to Lady Luck? Could get a shot of my tattoo? I would go, to prove it so. It’s vertically filming on a ridge. If it meant getting the perfect shot. He wouldn’t, he couldn’t if it were against the law. I would and could if I thought no one saw. There is not a place Mike wouldn’t go. 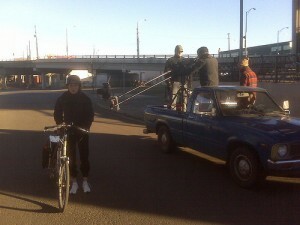 In order to be in the Filmed By Bike Show.